TLS-security-level “may” (“You *may* use TLS”) means your mail will be relayed even if the other mail server lacks TLS. 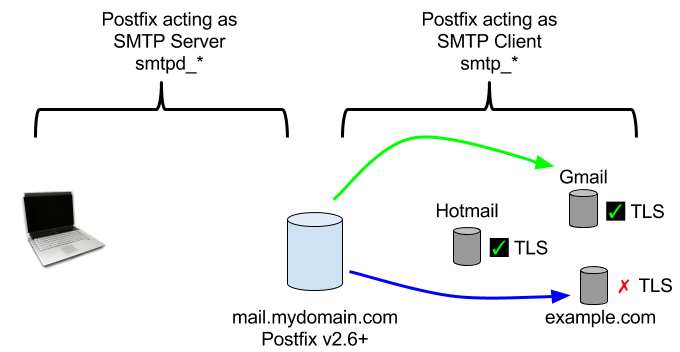 This is represented by the BLUE arrow in the diagram showing mail sent to “example.com”. In other words, such mail will be sent unencrypted, but it will successfully reach example.com. You may configure smtp_tls_ciphers and smtp_tls_protocols, but the defaults are OK and recommended. The default for smtp_tls_ciphers is ‘medium’. If you do ‘high’, there’s a (small) chance some of your mail won’t reach destinations that don’t support the strongest ciphers. The default for smtp_tls_protocols is ‘!SSLv2, !SSLv3’ (disable SSL v2 and v3), which is considered safe; it allows TLSv1. Svenn (https://www.svennd.be) wrote very helpful articles about how to use LetsEncrypt. Such certs are needed when *your* remote users (email clients) need to connect to your postfix server over a secure TLS connection. That’s another article.